I will certainly have more nephews in my lifetime but I think I'll always have a soft spot in my heart for this little guy. He's the first baby I've loved since becoming an adult; that little face captured me the first moment I saw it and I could hardly imagine loving any baby more. 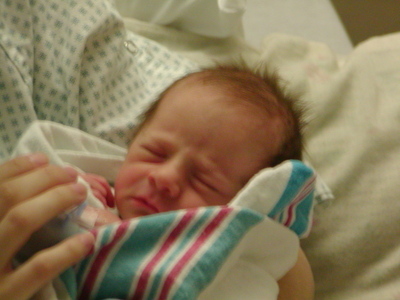 Then, of course, Camilla was born and the idea of loving a baby was completely redefined for me. 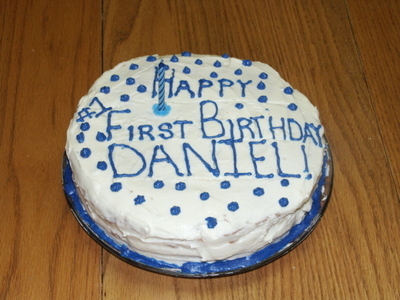 But Daniel is special to me and always will be, and I can't believe he is already an entire year old. Happy birthday, Pooky. You have to post a couple of table-sitting cake-eating pictures. The whole world should see them. He is beautiful - especially love his gorgeous eyes! Happy birthday, Daniel! He's a handsome little guy. 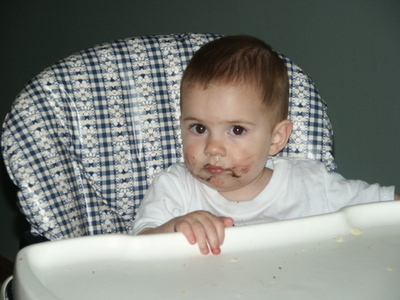 The imminent first birthday does take you aback a bit, doesn't it? I hate to tell you this, but I'm starting to suspect that EVERY birthday is like that. At least, my kidlet's second birthday is two months from now and I find the prospect just as jarring as I did the first time around :). WOW! Camilla is 8 months ALREADY!!!!! NO WAY! Pray for me this week, & for my bebies to have their own special angels! I have a niece and a nephew (just one of each), and let me tell you, they just each capture your heart in different ways...the first of each is something special, I think. On days when I am sad to still be single, I think of them and am so thankful that God let me be single while they are little, so I can love every minute!